4 Pines Indian Summer Pale Ale (left) and what Mountain Goat might perhaps want to do to it on the right. 1) To clear things up, this isn’t a post on Mountain Goat’s Summer Ale. I can see how you could be confused looking at the beer in the photo – it’s in a can, it’s an orange can, it’s got the words “summer” and “ale” in the name. 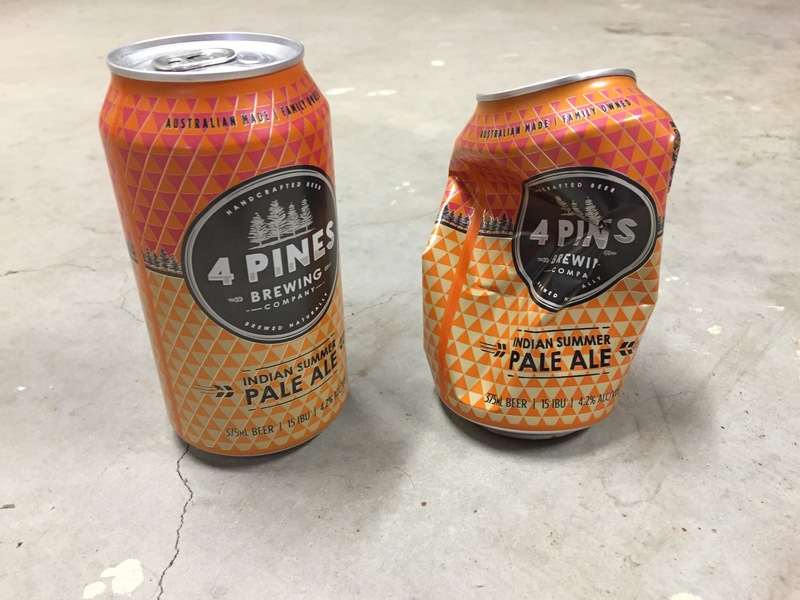 But it’s not that beer – it’s a beer from 4 Pines. Though I’d reckon the people at Mountain Goat were less than impressed the first time they laid eyes on this beer. In terms of the packaging, it’s really hard to write off those similarities as merely coincidental. 2) Dear God, that name – “Indian Summer Pale Ale”. Or is it “Indian Pale Summer Ale”? There are just too many words in the name. Especialy given it has precious little resemblance to an IPA. And when I see a beer incorrectly referred to as an INDIAN pale ale” it irritates me. And that’s what they’ve done here – perhaps to try and make a reference to an “Indian Summer” which is totally not a thing in Australia anyway. 3) Instead of that mouthful of a name why not something like Backyard Ale? Veranda Pale Ale? Because it’s that sort of beer – one you drink while relaxing in a chair in the backyard. Or maybe Coastal Ale? Drought breaker? Heatseeker? Shade? Summer shower? Holiday Ale? Sure these names may not be absolute winners, but neither is “Indian Summer Pale Ale”. 4) For all its similarities to Mountain Goat Summer Ale, I actually prefer the 4 Pines version. In the interests of full disclosure, I’m one of the small minority who was never excited by MG’s Summer Ale – the hop flavours were never quite there for me. Every time I would take a sip I felt like the flavours had been watered-down. Which is why I like the 4 Pines version. The hop flavours are just that little bit stronger and , for me, they don’t sit in the background like in MG’s ale. 5) The beer itself is really good. I just wish the packaging wasn’t so strongly similar to another, very successful, summer ale.